The cabins of the Silver Discoverer are all suites and lay the foundation for an unforgettable cruise experience. All suites feature butler service, which you can use throughout the journey. A refrigerator and minibar are also part of the furnishings that are included in various suites according to personal preference. The bathrooms are equipped according to European standards and the beds are equipped to the highest standards of luxury, so sleeping peacefully through the night is expected. Furthermore, the furnishings include everything that could be desired during the journey: an iPod docking station, a plush bathrobe, and a flat screen TV are all available. On board with the Silver Discoverer, culinary delights await passengers every day. There are 4 all-inclusive restaurants where excellent meals from all around the world are prepared on board. There are no specified meal times, so passengers may decide individually when you go out to eat and with whom. There are also special dishes that are specially prepared in the restaurants depending on the destination of the ship, which encourages guests to get to know the visited countries and culinary tastes better. Should passengers prefer to enjoy breakfast in the privacy of their own balconies, this is no problem aboard the Silver Discoverer. Aboard Silver Discoverer, there is plenty to experience, so a day at sea is anything but boring. Relax, for example, on the pool deck and enjoy the sun, or indulge in the beauty and massage center. For those who want a challenge, there is a fitness center on board. Never be out of touch from loved ones, as the Discoverer also features an internet café. Another highlight aboard the Silver Discoverer is the opportunity to learn to dive with experienced instructors so that guests may experience the wonderful underwater world while diving or snorkeling during stops along the journey. 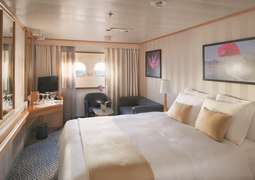 Silversea cruises are relaxing and are full of pampering in the first place. Therefore, the dress code is more relaxed and casual. Nevertheless, there is also the option to dine elegantly and attend evening programs.